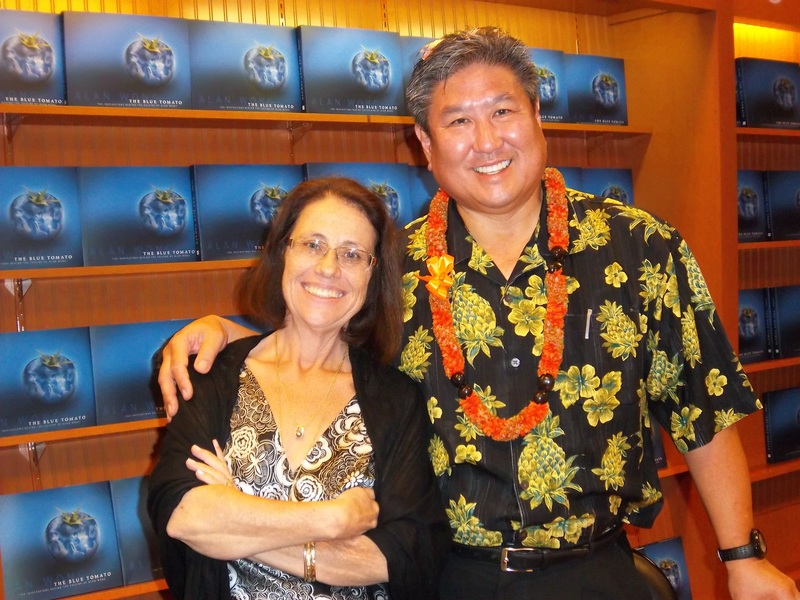 Wanda Adams with Chef Alan Wong at a book signing for "The Blue Tomato," Wong's latest book, January 8, 2011. After The Honolulu Advertiser published its last issue on June 6, 2010, there was a lot of confusion in the community. Most readers seemed to think the majority of Advertiser newsroom folks were picked up by the Star-Advertiser. Wrong. Of the 120-plus newsroom employees, only 26 were initially hired by the Star-Advertiser. In the feature department, Island Life, where I worked, only one reporter was hired initially: Mike Gordon, who covers film and TV. The former Advertiser features editor, Elizabeth Kieszkowski, is now editor of TGIF for the Star-Advertiser. After a few months, the Star-Advertiser also hired Zennaida Serrano as a part-time clerk. I begin with Wanda Adams, a beloved byline with an avid following throughout the state. Wanda was the food and books editor for Island Life. She also was the features editor for more than 10 years until she voluntarily stepped down because she missed writing so much and was, frankly, tired of dealing with the politics of being an editor in the Gannett system. Wanda has always been a supreme multitasker so it’s not surprising that she is juggling lots of projects and jobs. First, she has her blog which is lively, entertaining and educational. Find her at ourislandplate.com. While the focus is food, you’ll find lots of warm remembrances of Wanda’s small kid time on Maui as well as some really interesting cultural and anthropological insights into our Island way of life. Second, she is working part time for Paul Brown, owner of Paul Brown Salons & Spas, as his assistant. This has enabled her to learn new skills such as strategic business thinking and event planning. The company is always expanding with new products and locations, as well as doing an incredible amount of work for charities throughout the Islands. Third, she is freelancing for The Star-Advertiser and Edible Hawaiian Islands, part of a nationwide network of magazines focused on eating local and eating healthy. Her most recent article was about Meyer lemons. Next up: Portugese cabbage. Speaking of her Portugese heritage, she has nearly finished a cookbook on Portugese cuisine in Hawaii and is currently looking for a publisher. As if all that was not enough, Wanda is also working with former Advertiser employee Esme Infante Nii on the new momsinhawaii.com blog. She’s helping her get together several subject areas designed to be helpful in every area of motherhood and child rearing. Wanda loves that she gets up in the morning and gets all dressed up and does her hair and makeup to go to Paul Brown. When she goes home in the afternoon she puts on her jammies and sits down to write. It’s the best of both worlds. She has even discovered the pleasure of an afternoon nap. The transition from The Advertiser hasn’t always been easy for Wanda. “There was a difficult mourning period that started months after the layoff period when I thought ‘Oh God, I’m done. I’m cancelled. I will never work for a newspaper again. Nobody needs me and nobody wants me professionally. I’m 59 and it’s unlikely I’ll get hired and I’m not moving from Hawaii.” But she got over those feelings and now “I’m still using all my skills all the time,” she said with characteristic upbeat enthusiasm. Catch up with Wanda on a daily basis on her blog at ourislandplate.com. In addition, she will be introducing a collaborative blog soon, working with “another figure here in Honolulu.” Stay tuned. There will always be more from Wanda Adams and it will always be worth reading. If you know someone who misses Wanda, please send them a link to this blog. This entry was posted in On Our Radar, Uncategorized. Bookmark the permalink. 3 Responses to Where are they now? How inspiring Wanda’s life is ! Yes, she is remarkable. I had lunch with her today and she is just thriving. thank you paula for sharing on how well wanda is doing.